Thanks to its Rodgers & Hammerstein classic songs, a topnotch cast and an equally praiseworthy production, the revival of SOUTH PACIFIC at the Ahamanson Theatre must be considered a triumph. The production, first. 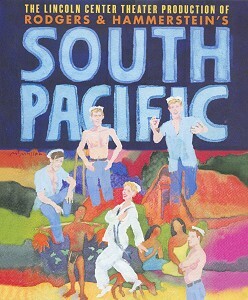 Originally mounted at Lincoln Center Theatre two years ago, SOUTH PACIFIC is again directed by New York-based Bartlett Sher. His design and creative team, notably set designer Michael Yeargan, have collaborated with him on the L.A. version as well. Even the music director, Lawrence Goldberg, brings his LCT expertise to the project. Many members of the large cast were also in the New York show, the important exceptions being the leads. At the Ahmanson, Carmen Cusack and Rod Gilfry play Ensign Nellie Forbush and Emile de Becque, respectively. Gilfry is a highly respected L.A. opera singer, a baritone with a large, resonant voice that serves him well in SOUTH PACIFIC. After all, the role of the French planter Emile was first--and famously--sung by Ezio Pinza. Gilfry more than holds his own throughout, especially on the show's two main arias, "Some Enchanted Evening" and "This Nearly Was Mine." As for Cusack, a Texas-born soprano who has worked extensively in British musical theatre, she is good enough as Nellie to make you forget Mary Martin in the original Broadway production (and Kelli O'Hara at LCT as well). Small, bursting with energy and charisma, possessed of a bell-like, melodious voice, Cusack lit up the stage every time she appeared (particularly in the comedic scenes). She is, without question, a star in the making. Other noteworthy performers included Matthew Saldivar as the U.S. Navy hustler Luther Billis, Anderson Davis as Marine Lt. Joseph Cable, Sumie Maeda as the island girl Liat, and Keala Settle as her bawdy, conniving mother, Bloody Mary, who croons two of the show's many superb songs, "Balie Ha'I" and "Happy Talk." SOUTH PACIFIC'S book, adapted by Hammerstein and Josh Logan (the show's first director), makes a plea for racial tolerance and harmony. The message is still relevant today, but it's the score that the show will be remembered for. In addition to the songs mentioned above, SOUTH PACIFIC offers "Dites-Moi," ""A Cockeyed Optimist," "There Is Nothin' Like a Dame" and "I'm Gonna Wash That Man Right Out of My Hair"--among many others. They don't write songs like that any longer, which is why there aren't many shows like SOUTH PACIFIC any more.